As I’ve taken on new responsibilities at work, I’ve noticed myself sometimes talking too much in meetings with my team. Often I can see that my need to talk is rooted in fear – fear that I might not be good enough, that I might not be focusing on the right things or doing the right things, that I might not deliver something meaningful. I imagine the person can see my fear as if it were the clothes I were wearing. I know that I am missing something important by talking instead of listening. In part I’m really excited about what we are doing and have very strong ideas about the direction that we can go. As a leader, the organization is counting on me to have a clear vision, articulate a strategy and motivate our team to transform. That certainly takes communication, in a variety of forms, and being in action. What’s becoming clear, however, is that it also takes being still and listening. Really listening. When I catch myself truly listening, I see its power. When someone talks and knows that I’m really paying attention and ‘over there’ with them, it’s almost like I can see them expanding, me opening, our discovering. I’ve noticed that sometimes listening is one of those things that I often do better with people I don’t know than with people I love. Having been with my husband for nearly 30 years, I often think I know what he’s going to say, or I catch myself not really listening – I’ll be thinking about the things I forgot to do or what I need to get done, not really being there with him. Hmmm…is that the way you treat someone you love more than life itself, I wonder? I’d like to grow in my ability to step outside of myself and really connect. So what is true listening? My experience is that when I truly listen, I hear more than words. It’s like music. When I listen to a good song. I hear not only the words, but also the emotion. It can move me when I really open up to it (or, it can just play in the background without effect if I’m not tuned in). You can hear feelings. Your ears can give you a view into who someone is, what is happening for them, how they view a situation, what they might be needing. Try it in your next conversation. Pause. Tune it. Just listen. Notice what you hear. Their voices are gifts when we open to receive. Do you hear fear, the sense of urgency, the tension, the pain, disappointment, uncertainty? Do you hear joy, the desire to celebrate, the passion, the invitation, possibility in their voice? Thoughts/answers/responses will come up as the person speaks. I’m practicing noticing them (accepting them, not judging them, or me), releasing them, letting them pass, and refocusing on the other person – their words, the tone, the volume, the energy, the mood. Ironically, the act of listening – and turning our focus to someone else – is a way to learn not only about the other person, but also about ourselves. In order to go over there and be with the other person, we have to step out of our own insecurities and self-absorption. True listening is a skill and takes practice. In the past, I’ve committed to being present in my work meetings or conversations with people – to not multi-tasking or thinking about the next thing I need to do. Old patterns of busy-ness inevitably return. I’m inspired as we enter a new month to try something more focused. 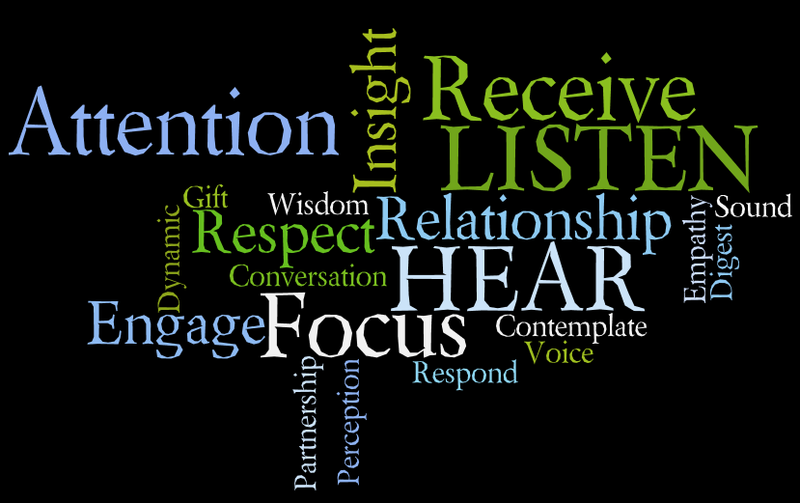 I am going to dedicate one interaction a day (a meeting, a conversation, a conference call) to true listening. Do you want to join me in seeing what we can learn about those around us and about ourselves from true listening? Photo by Vicki L. Flaherty, near Keswick, England, September 2012. 🙂 Thanks for coming by Thorben. Really good reminder of how effective a good listener really is. 🙂 I find myself challenged not by people I adore, but by those I resent or have had problems with. Not only am I not tuned into their channel, I’ve turned off the radio. Wonder what would change if I simply let them talk, without the need to respond, defend, challenge, etc…. I could say, “That’s interesting.” (which can also sound dismissive, I’m laughing as I write it). Better: “That’s a great point.” without adding or taking away from it (like, “But…” ) You’re such a teacher, Vicki. You move from student to teacher better than anyone I know. I was just reading this morning how those people that challenge us do so because we see something in them that we have not resolved in ourselves….that’s a whole ‘nother discovery process! I love the say nothing, and or the “mmmmm” or your excellent “I’m taking that in.” (You have such good scripts.) I totally buy your last statement… and yes, a whole other discovery process. I was thinking something similar but not so well stated, after reading about the people in China who went on a stabbing spree this weekend. They wouldn’t do that to cats, why would they do it to humans? I think it has something to do with being unable to resolve the fact that we are actually all the same, no matter what ethnic or religion background we have… sparks of the divine, no more, no less, no matter who you are. Here’s to discovery… thanks QV! what a great post! Somewhere deep inside we understand that true listening is the ultimate sign of respect…but how often are we able to do that? 😉 I find it difficult especially when I am busy and under time pressure (which is too often lately and as nicely put it some of my old patterns appear as well 😉 Then I am upset that I was not patient and didn’t better take a breath and just relaxed while fully and actively listening to others..! Jana, it seems the world works the same on both sides of the ocean! I too get upset with myself when I didn’t ‘do better’. I’m learning to accept that I’m not perfect, never will be – why is that so hard to accept? (Talk about old patterns!) A great coach once reminded me of the power of being present even 1% more of the time. So let’s embrace those moments when we shine and lean into the opportunity to do it more. HI Vicki, I am not going to say anything – I am listening .. :O) .. This post resonated with me, in part because one of the best takeaways from my study of conflict resolution was the importance of “active listening,” where one listens to the words, the feelings, the positions and underlying interests being communicated. In one of my classes, we were divided into groups of 3 and took turns relating a story and having the others listen. One would listen for content, and the other for what wasn’t being said but was being conveyed in tone, body language, etc. Powerful stuff. Truly listening is work, takes practice, and requires full presence. But wow, is it worth it. Jennifer, thanks for sharing. I love that activity and might just integrate it into some things I’m creating! Here’s to being ‘active’ when we’re listening – to catching the words and the other stuff! Your blogs are always perfect timing for me. As I read your blog, I thought about the week that I a cold and didn’t feel well. I had to really focus on truly listening to others during the conversation in order to understand their meaning. I didn’t just want to say anything just for the sake of saying something. So I just used more emails, social messages, and Sametime pings to communicate. This gave me more time to let it sink in when I wasn’t feeling my best. Social tools came in handy that week. Also, I liked how you connected “talking too much” with “fear.” I think this is so true. This gives me something to hone in on during my next conversation and meeting. Thank you for your insight. I will start to practice this each day! Jennifer, I hope you are feeling better this week. Sounds like we are sharing these colds, even though miles apart. I love that you learned something about communication as a part of your being ill. The body sure has a way of slowing us down and getting us to pay attention sometimes, doesn’t it? A gift! Fear can be so subtle, can’t it? Kinda fun to explore how it shapes the things I say – hope you enjoy the discovery and experience, too! Glad to have you on board!